Ford & Friedman is a full-service family law firm that handles all aspects of divorce, child custody, and family law for clients throughout the Henderson and Las Vegas areas. Since we only focus on family law, we have the experience to advise you intelligently on what options best serve your interests. Whether you are interested in filing for divorce, need help securing parental rights, or have been separated for many years and need a modification, our Henderson family lawyers can guide you to a favorable solution. We understand that family issues are emotionally trying and demand careful attention to your unique circumstances. Our dedicated team of lawyers has time and again proven that our knowledge of the law and attention to detail surpasses that of other Henderson family law firms. 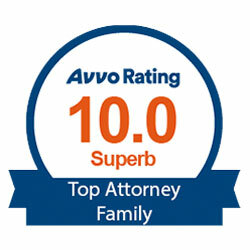 You and your family can benefit from the personal attention and individualized service of our attorneys. Contact our Henderson law firm at (702) 904-9898 to schedule a consultation. We serve families in The Ridges, Anthem Country Club, McDonald Highlands, Dragon Ridge, Green Valley, and Summerlin. custody, and general family law. At Ford & Friedman, our seasoned professionals take a tailored approach to each family law case, working together to carefully craft the right strategy for each family and their unique circumstances. Equipped with proven insights, a wealth of legal resources, and a tireless determination to help our clients, we get results while providing our clients with personal service. Our attorneys will work face-to-face with you. You will never feel like a case number with us. Discover how our AV-rated firm—the highest distinction given by the Martindale-Hubbell Foundation, can help you create the future you deserve. Our lawyers grew up here and are dedicated helping their local community. We are also familiar with local judges and courts and know how to successfully guide clients through the legal system. Our boutique law firm has handled a wide range of family cases, and we know full well that each client needs and deserves an individualized, sophisticated strategy for their specific case. With us, you will benefit from having a team of attorneys behind your case. You will also be joining forces with legal advocates who work well with clients, developing relationships that outlast the case. Our divorce attorneys will give you individualized attention and service. We will be personally invested in your case and in securing you the best outcome possible.